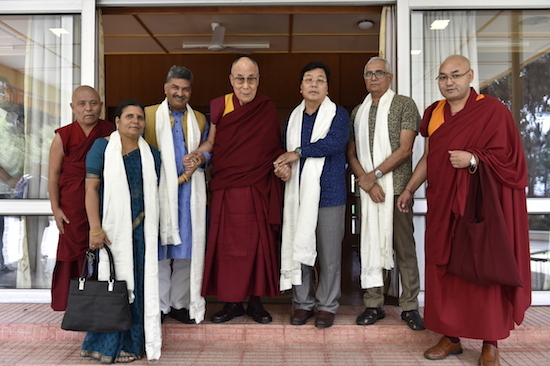 (TibetanReview.net, Sep07, 2016) – Two Indian MPs, joined by their entourage, on Sep 2 called on Tibet’s exiled spiritual leader, the Dalai Lama, at his residence in Dharamshala. They were joined by the Speaker and Deputy Speaker of the Tibetan Parliament in Exile. Sep 2 was the 56th Tibetan Democracy Day and Rajya Sabha, or Upper House, MP Mr Mukut Mithi was the chief guest for the Central Tibetan Administration’s official function. Mr Mithi is a former Chief Minister of Arunachal Pradesh, which is claimed by China as south Tibet. Lok Sabha, or Lower House, MP Dr Arun Kumar was a special guest for the occasion. While Mr Mithi was joined by his former advisor KD Singh, Dr Kumar was accompanied by Mrs Nirmala Kumari. The Dalai Lama spoke to the visitors about the close cultural and spiritual ties between India and Tibet, expressed gratitude to India as the home of Tibet’s spiritual heritage and for its continued support for the Tibetan people over the last 57 years.